After roughly ten years of casual looking, I've realized it's not an easy task. I always thought that if I just laid low one would come around eventually. I've never really been aware of anyone actually searching it out and assumed it wasn't a priority for most collectors. I thought I would've found one by now. I do own a used version which is in my avatar and over the years have seen 2 used pink, 1 used black, and 1 other used white(fos to professor) like mine. Now after spending so much time on my own looking without any luck, I feel I have to call on the community for help. I know that there are some completists out there when it comes to Santa Cruz decks but I humbly appeal to all of you and the skate gods to wish me luck in landing one of these NOS white dips again. I'm a bit of a hoarder so I'm not into trades. Also, I find it difficult to trade art and usually feel uncomfortable with the deal. For those reasons, if the opportunity ever presents itself, I would like to deal in cash only. Of course I'm interested in owning other decks. Although, this deck is currently the only one that I feel warrants publicly approaching the community with a thread. While going through my old photos looking for a shot of me as a kid wearing a red paisley shirt while holding my new Special Edition I stumbled across a few other cool photos. Since I will be bumping this up occasionally…not obsessively, I thought I'd share a few. 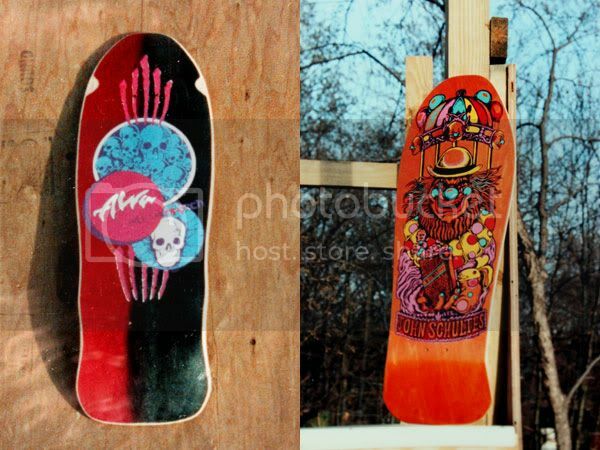 I liked to do grip art on all my boards from 1986 through 1992 (yeah, it's a little odd but I had always liked to think of the decks as little works of art) and then I just started doing full grip. The bottom one is an Agah – Going through Life with Blinders (slick). There were so many others that I didn't take shots of or have now lost the photos…I always had fun doing it! …as you can see I wasn't partial to any company…just what felt good under my feet at the shop. I thought jkelly/Go Skate or Go Home and vaskateboards would dig this one! A shot of me from around 1990 doing a footplant off a guardrail at an old skatepark in Michigan called Skate Escape. Best of luck on the hunt . I can barley stomach the news . I love pics from BITD like that one, the stoke on the kids face holding a piece of awesomeness like that is something i remember fondly. Grip art is sick. Do you still have any of those decks? I wish I had some pics of mine. Good luck, this sounds like it will be a really tough one, but then again some stuff just shows up here and you go farrrk where did that come from??? Kendall Atom Man red man teal stain blacktop. 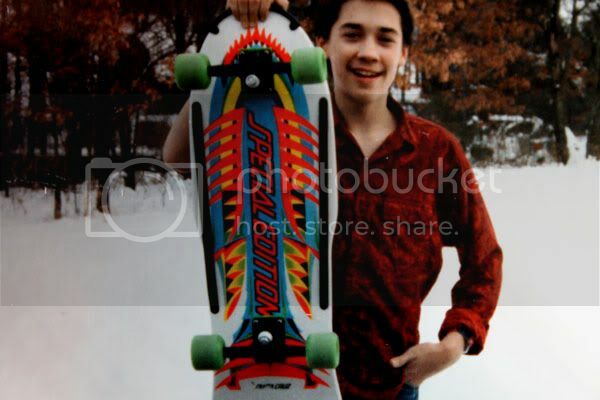 It's funny to see that pic in the snow, I can't imagine getting a skateboard for Xmas and not being able to ride it for the snow! ...agreed chall5, it'll be tough. Kind of an off-beat but rare deck. It's fun to keep looking! Jay, thanks. I thought it was a killer variation as well. Black and green sounds pretty sweet too. I was hoping a few members would've dug it? Seems like I had read a thread on here a while back where someone was referring to either Schultes being on the forum or that he was looking for some of his old decks? If you got a a line on him or wanted to pass it along, I could provide a better quality image. Too bad the deck is long gone. GETOCAT & Scotty T, Thanks! I really appreciate the well wishes! Scotty, I actually do have two survivors with the grip art intact. 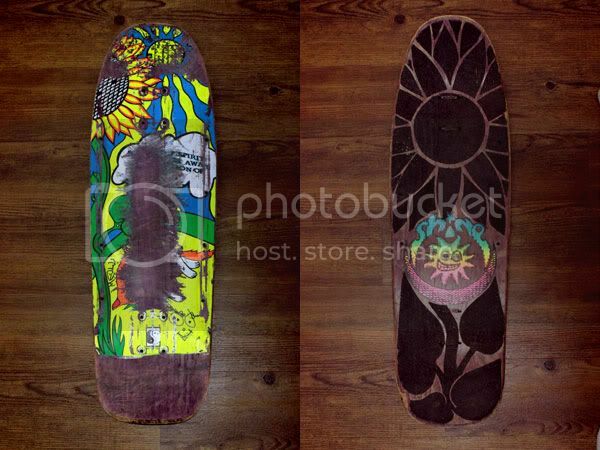 -One is a deck I retired early back in the day, cause I loved it so much. I learned so many new moves on it and the girl next door was always coming around while I was riding it , he, he...good times. The ramps were starting to tear at the plys from sliding over screw heads and I just didn't want to see it destroyed. -The second, is the ramp complete that was left in the rafters of my parents garage when I moved away from home. I'm so happy to have it now! After twenty years I realize it's a perfect time capsule of my most ideal setup, at the peak of my ability, and has been totally untouched. I went on buying decks(while the one sat in the rafters) and soon after started only doing full grip. Things got more serious in my life, in skateboarding and the grip art seemed too outlandish for the darker 90's mentality. Oh, and snow...what snow? We would find any dry piece of cement!! Maybe, I'll post some shots of the survivors in a future bump . - Ah yes, a third survivor with grip art intact…one delegated to the street! If anyone has ever seen a white NOS SC Special Edition mechanical fish in any private collection, please…shoot me a pm!